You don't have a business if you don't have customers willing to pay for your product or service.In "How to Sell in ANY Economy", authors Lee Cassells, Catherine Brownlee, and Stan Peake teach employees, employers, business leaders and owners how to sell like never before.Thousands of hours of research into consumer behavior and motivation are combined with 70 years of business experience to bring a profound yet simple strategy to sales professionals everywhere.Learn how to sell without compromising your integrity, in a way that builds trust with your customers. 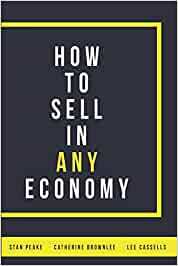 "How to Sell in Any Economy" will become your trusted playbook, your go-to resource, as you build a better business and a more rewarding career (in any industry)!This book will help you improve your strategy, habits, psychology, and how you go about every sales opportunity. You will be a more effective sales professional after reading this book, no matter how great or experienced you already are. You'll also love the process, which means you're going to keep getting better day after day because this book will enhance what you do and how you do it! 5.0 out of 5 starsThe most important skill in sales is knowing yourself! This book goes beyond how to sell and delves into the why? It helps those new to sales, and those of us who have been doing it for decades, to think about the customer first and foremost. Well done Lee, Stan and Catherine. You wrote the book that starts where I finish off with "Powerful Personal Brands." I see them as great companion texts. Welcome to authorhood, you have contributed nobly and added value to those who see sales as a craft and not just a way to make a single sale. I received a preview copy of this book from a friend and enjoyed it immensely. I'm a small business owner and found it to be a concise evaluation of the sales process. Knowing yourself, knowing your customers and positioning yourself accordingly. 5.0 out of 5 starsExcellent take on being in sales and staying authentic. This is a truly excellent book. How to be an authentic sales person and not lose your soul. Very well done.